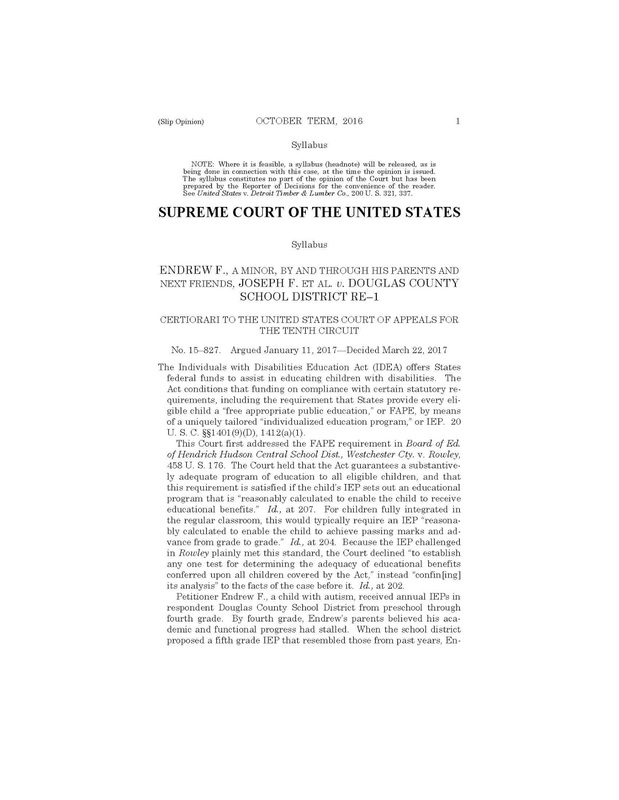 According to Kirsch-Goodwin & Kirsch, the Supreme Court today issued its opinion in ENDREW F. v. DOUGLAS COUNTY SCHOOL DISTRICT No. 15–827, which was to how much educational benefit an IEP must provide to a student with a disability under the Individuals with Disabilities Education Act. In a unanimous decision, the Court held that "a school must offer an IEP reasonably calculated to enable a child to make progress appropriate in light of the child’s circumstances." Not the enlightenment parent attorneys would have liked, but some welcome guidance in the nearly 20 page decision, including that a student must be offered an educational program that provides more than de minimis progress from year to year, and not so low that children with disabilities should receive instruction that aims so low that it would be tantamount to sitting idly. The Court vacated the decision of the 10th Circuit below, and remanded the case back to that court for further proceedings consistent with the Supreme Court's opinion. So what does that mean? More litigation. Ever get lost with all the acronyms schools throw around at IEP meetings, print this list out and put it in your IEP notebook - the notebook that you should have for your child, and which you take with you to every IEP meeting, RED meeting, pre-MET meeting (ah, more acronyms). For discussion and explanation of some of these terms, visit our website Kirsch-Goodwin & Kirsch, PLLC.